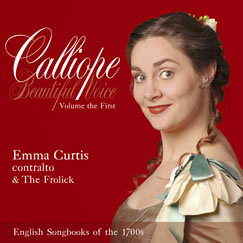 Emma Curtis & The Frolick invite you back to London, 1739, for an evening of music-making at the height of Handel's fame. Performing music from the era's most popular songbook, with period instruments and style. More than fifty songs from the opera, theatre, coffee-house, travern, folk and soapbox. The Frolick seeks to breathe life and fun into the neglected chamber, opera and theatre music of the late 17th and 18th Centuries. Their first recording together, Calliope shows a broad and entertaining picture of 18th century London, reflecting the society for which it was collected, allowing us to see and feel the world and the humour in which its songs were born. Each song is its own microcosm of society and style. Hear selections from Calliope Visit www.thefrolick.com to learn more about The Frolick. FANFARE Magazine's Review: "The results are very impressive indeed. 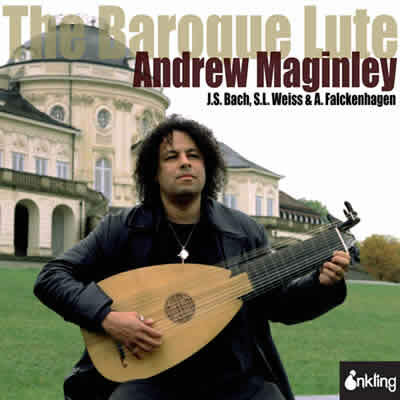 Maginley is a highly intelligent player with an excellent, fluent technique always at the service of the music he is playing. Every movement he plays here shows a real sense of structure, each given a clearly defined shape, something not to be gainsaid with the lute. His voice leading, too, shows a real understanding of the counterpoint of Bach and Weiss, which consistently emerges with admirable clarity. High praise, too, for the rich variety of timbers and nuance Maginley draws from his instrument ... Excellent sound and an informative, well-written note by the performer further enhance this auspicious debut for the label"